I have purchased a Winstitch software yesterday and am now trying to work on my first chart. - the Happiness Fairy. I seem to be having trouble with backstitch (outlining) - I need an outline in the oval shape. 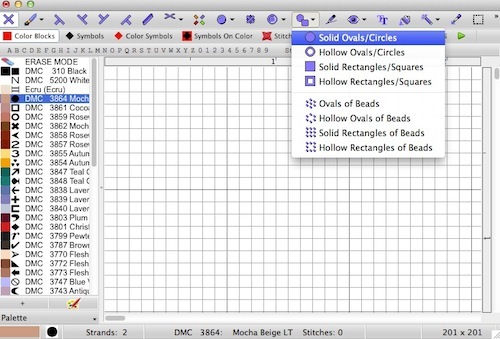 I choose the "backstitch" option, but as soon as I select "oval or circle" option it goes back to reguar stitches (cross stitch). 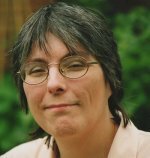 I appreciate any advice or suggestion you can give me. Thank you so very much! Your story has become my inspiration. 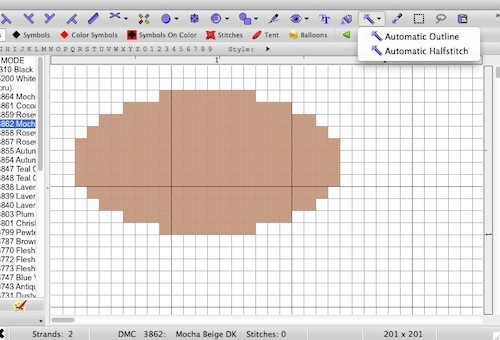 The shape tools provided in WinStitch and MacStitch are designed for use with cross stitch, Katya. If I need a backstitch outlined shape, I first pick a contrasting color thread, and pick the shape I want from the drop down list. Then I draw the shape to the size I want, where I want to place it. Next I choose my outlining color from the palette, and click on the magic wand icon in the toolbar. From the drop down list I chose Automatic Outline. By moving the cursor across to somewhere inside the shape I drew, I can click the mouse and that shape is automatically outlined for me. 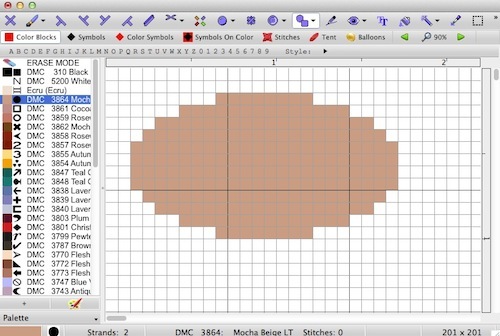 If I do not want the colored cross stitches in the final design I can then just delete them, leaving a backstitched oval or circle on my screen. P.S. 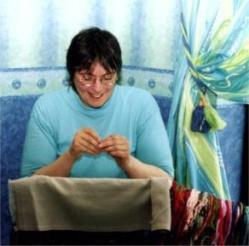 The screen captures were done in MacStitch, but the principles are the same for both this and the WinStitch version of the program. This is a two step process. 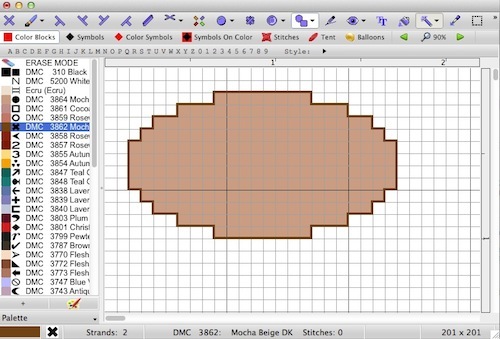 First select the backstitch icon from the tool bar. It is the diagonal line symbol. The pick a colour from the palette to use. When you then draw the backstitch lines on your chart, they will use the selected colour. You can pick a different colour if you want to outline sections in different shades. I love this program, but my question is: How can I set the backstitch color in the palette? There are only cross stitches colors, how to mark that one of them is backstitch.